As Christopher Hume recently said, for planners everything hinges on what sort of city we have, what sort of city we want, and how to get from one to the other. And that is the challenge set out before the City of Toronto's new chief planner. Gregg Lintern - who has has spent his entire career planning the city - certainly has his work cut out for him, as city planning lands at the intersection of so many important conversations shaping the city – most importantly affordable housing and transit. dandyhorse caught up with the chief planner to talk about how bikes fit into an efficient transit system as the city (continually) tries to grow up. What projects are you most excited about that are happening right now in Toronto? We need to continually ask ourselves what kind of city we want to be, and work to deliver a vision in real, tangible ways. Whether it be the new cycle track on Lakeshore Blvd. in Etobicoke that just opened, trying out new ideas like the King Street Pilot, or guiding development of complete communities along new planned transit lines -- what is exciting is that we are getting smarter about using finite public space, inducing more choice through design and making linkages between improving access and growing opportunity for more people across the city. Do you believe bikes are part of an efficient transit system? Absolutely. For example, many of trips in the downtown area are under 5 km – and this is a very reasonable distance for cycling, for making a healthy choice. When we think about mobility across the city, getting more people travelling by bike is an important part of relieving overcapacity on TTC routes and vehicle congestion. Cycling is also a key component of multi-modal trips – getting more people cycling (and walking) to their transit hubs, avoiding unnecessary parking and vehicle trips to subway stations and GO stations. Can you help our readers understand the importance of corridor studies and how they apply to bike lane development? On active commercial streets, it is very important to work closely with merchants, residents and affected stakeholders when investigating proposed cycling infrastructure. Major corridor studies are a tool that can be used to understand the impacts of different roadway configuration options, the views of the local community and businesses, and to select an appropriate design that best meets the needs of users and stakeholders. It is important for the City to complete this analysis so we have an understanding of the best design (such as type of physical separation and modifications to intersections), and other potential changes to the street to mitigate challenges that may arise from redesigning the space. Factors like vehicle speeds and volumes, streetscape, parking, loading and deliveries, potential intersection conflicts, TTC routes, and network connections all play a critical role in determining what works best for the area that is being studied. I do ride a bike. I’ll admit I’m more of a fair-weather cyclist. I bike on many local and main streets, and living close to the West Toronto Rail Path and the waterfront now, I find myself on those routes and trails a lot. I am inspired by so many people I work with who bike to work as all season commuters. 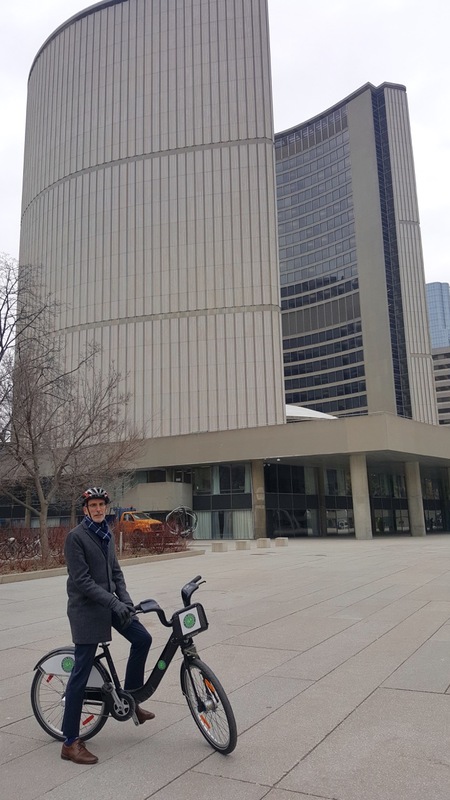 As a planner, I am a big fan of Toronto's Bike Share program and believe that it does a good job of both supporting and encouraging people to cycle in the core, and increasingly outside, as the numbers grow. What is your favourite place to ride in Toronto? I enjoy a great day ride on the weekend in the summer. One of my favourite rides looks something like this: I like to head out in the morning from where I live in High Park, take the waterfront trail, and stop for a coffee along the way – maybe at the snack bar trailer at Ontario Place’s new east island park. From there I head east through the central Waterfront, and head up the Don to the Brickworks and grab lunch. Head north up through the ravine, west through Mount Pleasant cemetery and then further west across the Belt Line. Then I ride down through Forest Hill on to St. Clair and grab a cold glass of wine at a café – then it's west across the Green Line and associated streets to High Park. It's about 40 km – and it's all about city life, exercise, and of course, food and drink. What is your favourite part of Toronto? I really like to discover new places – I can vary my weekend cycling route a hundred different ways, or stop at different places along the way to rest and run errands, and I always discover something new when I do…all without leaving town. I just get out and ride! How do you feel about expanding the Bloor bike lane west and east along the Danforth? Through the ongoing Danforth Avenue Planning Study, City Planning staff heard a clear vision from the community for supporting complete streets and a walkable and cyclist-friendly Danforth Avenue. City Planning is strongly in support of working with the community, and our colleagues in Transportation Services (Cycling Infrastructure), to see this vision realized. Expanding complete streets goals along Danforth Avenue is an excellent opportunity to support safe transportation alternatives. How do you feel about bike lanes on Yonge Street? We know that as more people live and work downtown, in our centres and along our avenues, we are going to need to offer multiple options for people to move around. 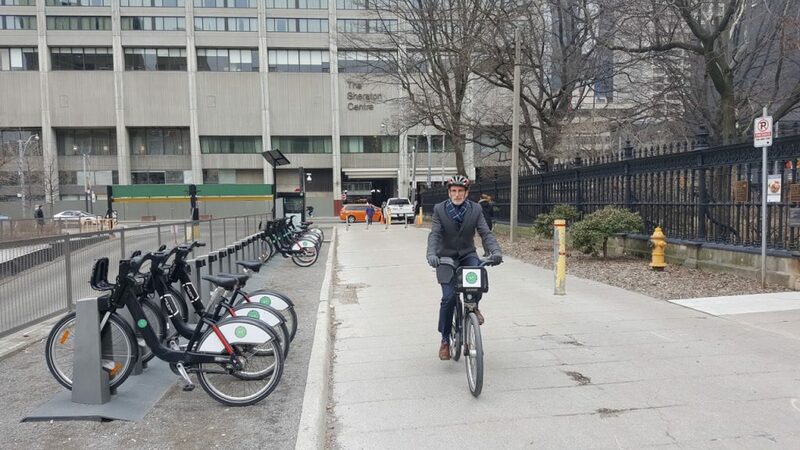 "Seeing that Yonge Street is one of our City's economic and cultural spines, it would be an excellent candidate for bike lanes." It is a continuous primary street, with multiple destinations and has a number of controlled intersections. Ultimately, you need a robust network and I’ll be looking for advice from the City’s cycling planners on the best options as we continue to build a network. How do you plan on tackling the affordable housing crisis in the city? Toronto’s growth and success raises challenges – among them the rising cost of housing and the availability of affordable rental housing. Our City's Official Plan sets out a strong vision for affordable housing choices that meet the needs of everyone throughout their life. When the market does not sufficiently supply housing choices to meet the demand, policy intervention is required. Protecting existing rental housing, replacing rental housing when redevelopment happens on those sites, and improving tower renewal neighbourhoods are all ways to protect what we have. We can use old ideas around pre zoning areas along our main streets to allow housing to be built more quickly in a way that works with neighbourhood main street character in mid-rise buildings. We are also working towards "as-of-right zoning" to allow secondary suites and laneway housing. Yes. To lead the City Planning division at a time when so many important conversations are happening and to lead a team of incredible city planners and designers is a great honour. I grew up in Rexdale and I’ve watched this city grow up right before my eyes. Today, Toronto is experiencing a relentless tension between enjoying the benefits and prosperity associated with decades of growth and being challenged to have that success shared by everyone across the City. I want our team to address that tension and influence change – on transit, on housing and on building complete communities – so that we leave this town better off than it is now.